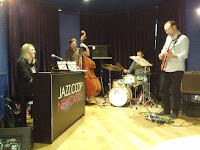 bebop spoken here: Joy Ellis Quartet @ The Globe Jazz Bar, Newcastle - May 12. 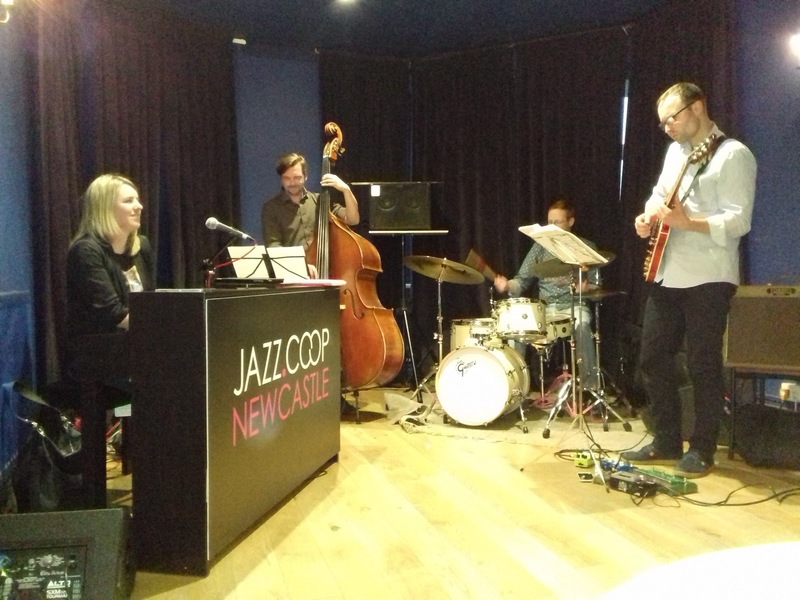 Joy Ellis Quartet @ The Globe Jazz Bar, Newcastle - May 12. Joy Ellis (piano/vocals); Chris Montague (guitar); Henrik Jensen (bass); Adam Osmianski (drums). Q: When is a trio not a trio? A: When it's a quartet! The gig was advertised as The Joy Ellis Trio but, after counting twice and double-checking with the lady sharing my table, we both agreed that there were definitely 4 bods making it a quartet. Our curiosity turned to joy (as opposed to Joy) when we realised the ringer was none other than local boy made good, guitarist, Chris Montague. Joy used James Kitchman on her previous visits to these parts and on the album which this concert was based around, Rob Luft, so Chris had some big boots to fill which he did admirably. The aforementioned visits included gigs in Hexham, Durham and Newcastle the last two of which were reviewed by Steve T and Russell respectively. I also reviewed the album Life on Land last October. So, Joy wasn't an unknown quantity to me. All of the plaudits reaped upon her in those previous reviews were upheld and if there was a downside it was the early mic problems. Fortunately, these were overcome and, once we could hear the lyrics clearly, those who weren't familiar with them now realised that they had in their midst, not only a fine singer and pianist but also a songwriter of great merit. Add her Pittsburg born husband and drummer Adam, Chris from Gateshead and Henrik from Denmark and you have a truly international team of stars. Joy, by the way, is from Sussex. The songs, in the main, were portraits of life through our composer's eyes reflecting the rich landscape she lives in whether it be urban London or rural Sussex. Close your eyes and we were there with her From Dusk Till Dawn, When the Snow Falls, Ice on the River, in The City, listening to The Jazzman and more.